Action: Massaging of hair & scalp with a proper nutrient hair oil gives additional nutrition to the scalp and prevents hair loss. Massaging also increases the blood circulation in the scalp & this keeps the hair roots strong. Anti-Dandruff Hair Oil prevents dandruff by eliminating microbial infections of the scalp. 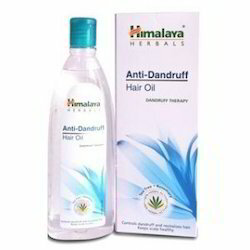 Himalaya's Anti-Dandruff Hair Oil avoids dandruff by removing microbial infections of the scalp. It smoothens the scalp and keeps hair cool. Pack Size: 100 ml and 200 ml. Love your healthy, dandruff-free hair What it does: Himalaya's Anti-Dandruff Hair Oil prevents dandruff by eliminating microbial infections of the scalp. It nourishes the scalp and keeps hair healthy. 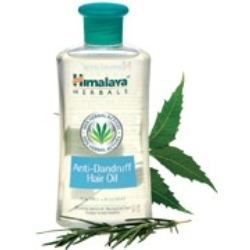 What it does: Himalaya's Anti-Hair Fall Hair Oil prevents hair fall and stimulates hair growth. It is enriched with the goodness of Bhringaraja and Amalaki which strengthen the root shafts and prevent hair fall.